Country Heart # 355,compliments # 354 Country in colors used, border design and size. 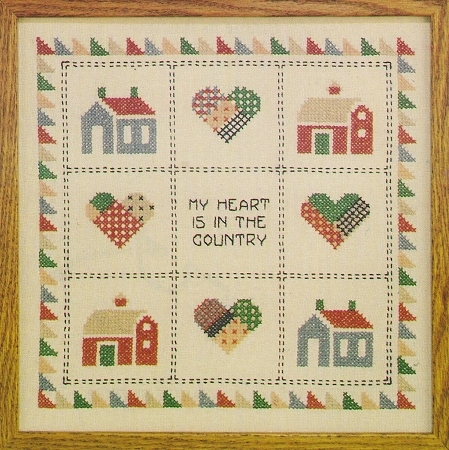 This folk art cross stitch stamped sampler includes houses, hearts and barns all in country colors.The saying gives a flavor of Middle America, barns,hearts with a quilting effect. I am very pleased with my purchase. Very good quality materials. I was also happy with the fast delivery. I will DEFINITELY purchase again! This is the first kit ordered from country stitching. Floss included was good quality. Pleased with service.